0 Comments Published by daveterry on Thursday, April 27, 2006 at 7:09 PM. 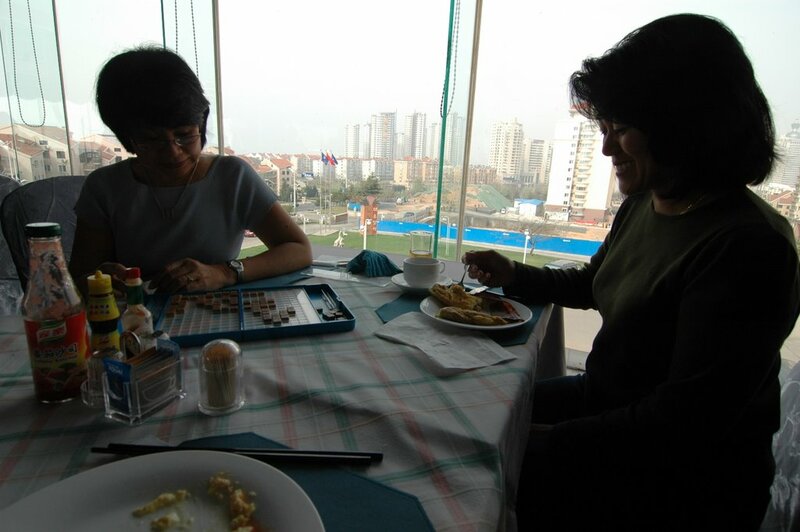 Ruth and Lynn always looked forward to breakfast to finish any Scrabble game they started the night before. 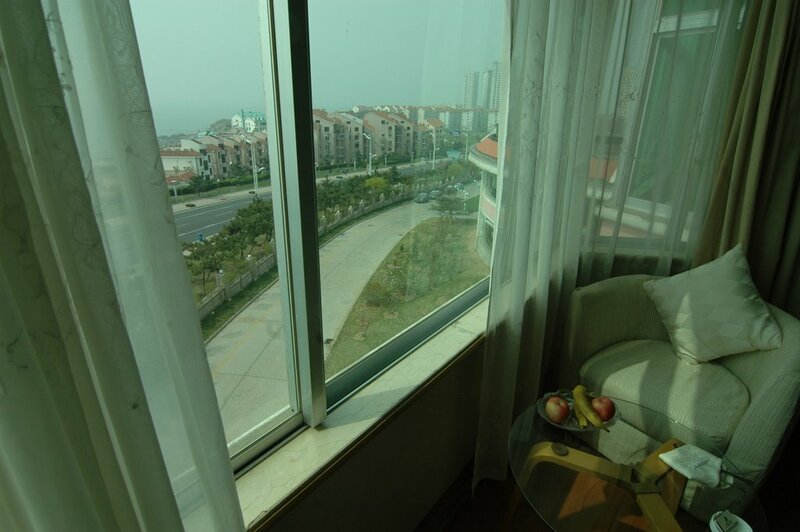 After the free breakfast buffet in our Qingdao hotel we got a ride to the airport for our flight to Beijing. We had a driver that didn't speak any English so got some language instruction. We asked him if he had any children. It's a question that everyone asks and is not considered too personal. If fact, the Chinese consider it showing personal interest. Such a question soon after meeting someone my be too personal in the west. Another common greeting I heard was: "Chila ma?" (Have you eaten?) During some of the difficult famine years the answer was often NO. Now it's almost like saying "Hello." When we came down to our airline gate two girls at either end of a cafe were announcing in unison what was in their stores. They sounded like a computer reading a menu because of the sameness of each sentence but their voices were beautiful. It almost sounded like a song in stereo. We made it back to the Rosedale but the room wasn't quite ready so we had a 30 yuan ($4) cup of coffee (the most we have ever spent on coffee) in the lobby and ate some Russell Stover chocolates Lynn gave us some as a parting gift. Thanks Lynn! We dumped our bags and went to Wangfujing...again. We wanted to pick up some books and trinkets We did well in saving money so had a little left over to shop. It was late at night and the lights were perfect for pictures. 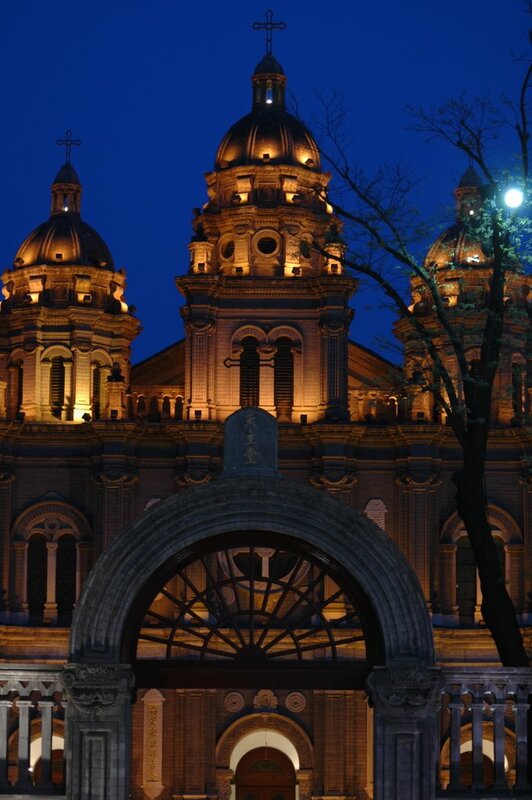 I took a picture of a Catholic Church just across the street from the Wangfujing Book Store. The U.S. dollar goes a long way in China. Don't expect to use a credit card a lot. Only at the good hotels did we use our card. Everywhere else we used cash. I just carried a folded sum in a binder clip in my front pocket. I never used coins. If we did receive coins as change in a store, we just gave them away to some folks needing help on the street. Once Ruth bought some milk and gave it to a woman who pushed her daughter in a wheelchair. The woman was very appreciative She held her hands together and bowed several times intoning "Xiexie ni." It's so hard to pass these folks in the street without giving them something. But I never did and kind of feel guilty about it. Ruth always wanted to give away our change or our food, and she did on several occasions. Sometimes they'd follow us a long way down the street, often walking a half a city block with us, before returning to their spot. I rarely saw anyone give them anything. It's not easy to do when you consider that we can buy anything in a store and sleep in clean sheets at the hotel while these folks look as though they haven't slept anywhere but on the street. In fact, we did see several sleeping on the sidewalk using the flower bed curb as their pillow. One woman slept while her two year old played in the dirt by her head.